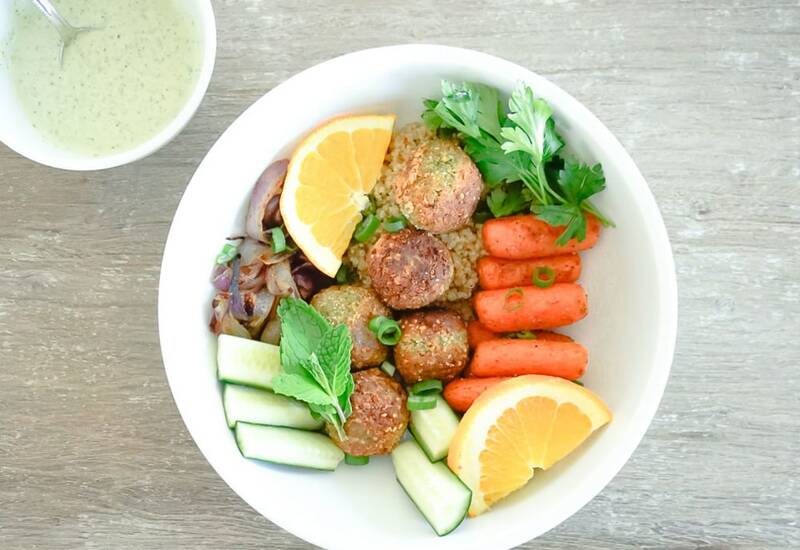 Buddha bowls are great for those who crave variety, since they pack in tons of nutrients, textures and flavors into one dish. This Middle Eastern-inspired, vegetarian recipe features homemade falafel and roasted carrots over a base of quinoa, all drizzled with a delicious savory yogurt sauce. It seems like it has a lot of components, but don't let that frighten you away. It's less work than it appears and the payoff is well worth it. The tart yogurt sauce would be equally delicious served with roast chicken or on salad—make double and keep it in the fridge if you like. To toast the pumpkin seeds, spread them on a baking sheet and bake in an oven at 400°F (200°C) for 4 to 5 minutes. Use canned chickpeas in the falafel mixture to save time. The falafel and yogurt sauce will keep well in the fridge; store for up to three days. Per Serving: 851 calories; 44g fat; 93.6g carbohydrates; 25g protein; 7mg cholesterol; 1729mg sodium. I initially tried this recipe for the falafel, but fell in love with the entire dish! The roasted vegetables with the pumpkin yogurt sauce was amazing! This dish is great with quinoa or brown rice. So nourishing and flavorful, and perfect for two people. These falafels were super tasty. I've made them a couple times with and without the bowl. This is a very filling recipe that's healthy and full of flavor.